The coming of autonomous vehicle technology shows great promise for eliminating traffic deaths and serious road injuries. The ultimate reason for death and serious injury from traffic crashes is that the human body can sustain only so much force, a key principle of the Safe Systems Approach, which aims to improve planning so that transport systems themselves eliminate traffic deaths and injuries that arise due to human error. For the most part, how quickly vehicles can react to incidents on the road and what speeds are safe for all road users will determine the overall level of road safety for all. Currently, many countries and cities do not have proper speed limits in place. It is clear that if all vehicles are connected and automatically driven (without human control), the network would be more efficient, safer and faster. 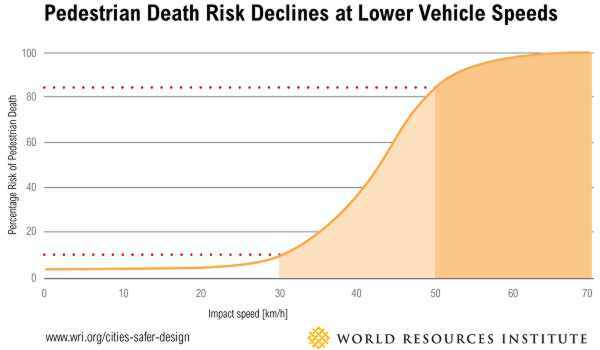 Would it be then the case to reduce the speed to increase safety (or at least perceived safety) or would we fully rely on technology?